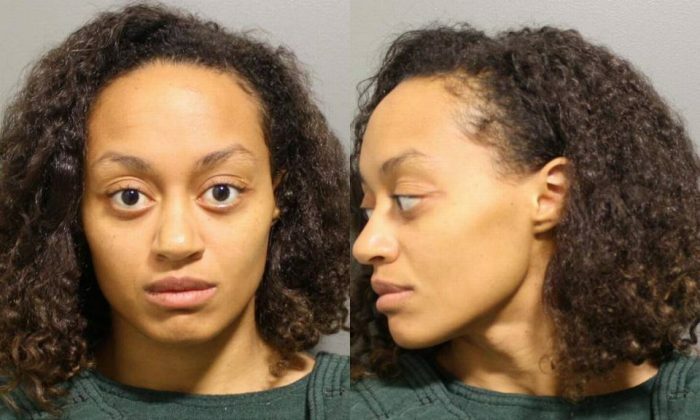 A Missouri woman is facing charges of first-degree murder and first-degree attempted murder after driving her vehicle into the Kansas River with her two children inside, according to reports. “On Saturday morning, members of the Douglas County Search and Recovery Dive Team recovered the body of a five-year-old child that was believed to be the third passenger in the vehicle that entered the river yesterday,” said the Lawrence Police Department in a statement on Aug. 4. The incident occurred on Aug. 3. Officers were able to locate the mother, Scharron Renea Dingledine, 26, of Columbia, Missouri. She’s currently being held at the Douglas County Jail without bond, officials said on Aug. 4. Local media reports said that her 1-year-old son was rescued from the river. Dingledine had no known connection to Lawrence, according to the Lawrence Journal-World newspaper. Clinton Bradley, the father of the slain 5-year-old girl, named Amiyah, told the Kansas City Star that Dingledine had recently been released from a 24-hour hold in a mental institution. She was sent there following a domestic violence dispute with the 1-year-old’s father, her current boyfriend, said Bradley. Upon her release, she was slated to have a meeting with Kansas Social Services officials, Bradley told the paper. “She could have reached out,” he added. Bradley said that the 1-year-old boy, Elijah, is fighting to survive in a Lawrence hospital, and he added that if he does survive, he will “never be the same kid physically or mentally,” the newspaper reported. The Lawrence Police Department said on Twitter that it is still seeking more information in the case. “We are asking anyone who had contact with Scharron Dingledine on August 2nd or August 3rd to please contact our Investigations Division at 785-830-7430,” the department tweeted. In a court hearing on Aug. 7, the woman’s newly appointed attorney, Carol Cline, said, “What we’re going to do first is I’m going to file a motion to evaluate competency,” according to the Journal-World. The judge scheduled Dingledine’s next hearing for Aug. 28. A funeral for Amiyah was scheduled for Wednesday, and Bradley set up a GoFundMe page for funeral costs. According to the Star, he hadn’t seen Amiyah in over a year because he could never reach Dingledine, saying that she moved often and didn’t have a working phone.